How does AllicinMax® differ from other garlic-based supplements? No other garlic supplements contain ANY allicin. They rely on your body being able to generate allicin once you have swallowed the tablet or capsule. Garlic oil supplements are produced by distilling fresh garlic, the oil that is produced is then diluted and placed into a capsule. This destroys most, if not all of the available allicin. A few garlic powder supplements can generate some allicin but this depends on the prevailing stomach conditions and may take several hours to accomplish conversion to allicin. New AllicinMax® doesn't need to wait to be converted since it actually IS allicin. When AllicinMax® enters your stomach it dissolves for easy absorption into the blood stream and breaks down to form allicin derivatives. The allicin in AllicinMax® likes the acid environment of your stomach, unlike other supplements that can be inactivated by acidic conditions. 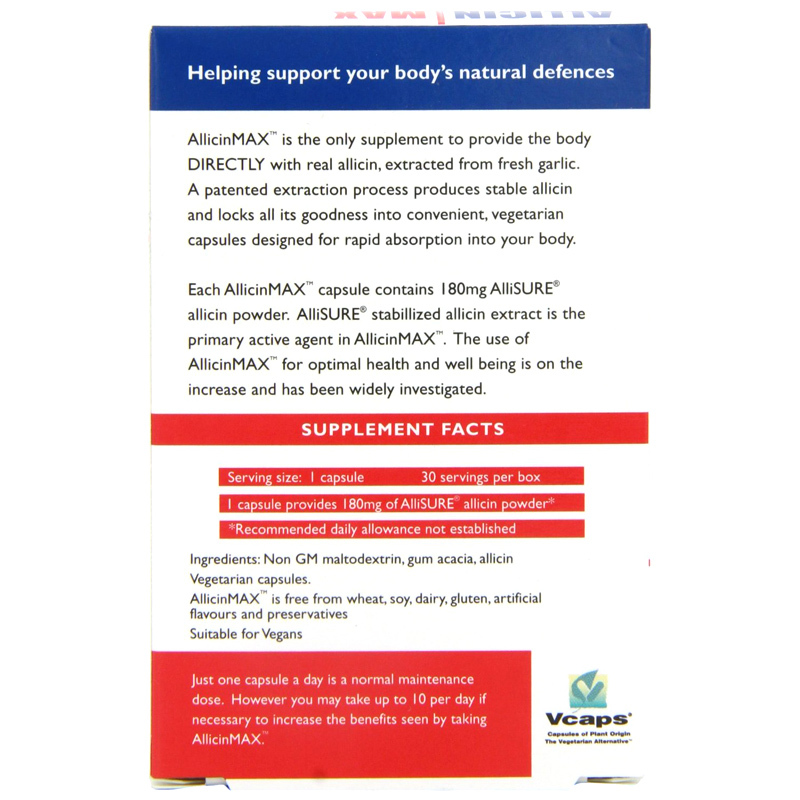 AllicinMAX is the only supplement to provide the body directly with real Allicin, extracted from fresh garlic. A patented extraction process produces stable allicin and locks all its goodness into convenient, vegetarian capsules designed for rapid absorption into your body. Each AllicinMAX capsule contians 180mg AlliSURE allicin powder. AlliSURE stabillized allicin extract is the primary active agent in AllicinMAX. 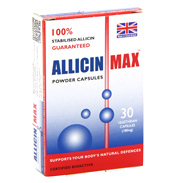 The use of AllicinMAX for Optimal Health and well being is on the increase and has been widely investigated. 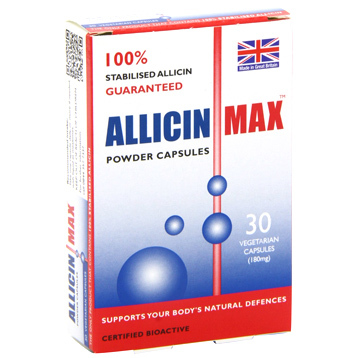 AllicinMax capsules contain 180mg Allisure® - concentrated natural allicin extracted from fresh garlic. Casing is non-GM maltodextrin. AllicinMax is free from artificial colouring, flavouring, salt, gluten and preservatives. Suitable for vegans and vegetarians. Up to 12 capsules per day may be taken if needed, and just one capsule a day of AllicinMax taken with food is beneficial for health and well-being. It is easily absorbed, and. Government approved tests show that as many as 777 capsules per day can be taken without detrimental effects! This product is classified as Dietry Supplements and such are not intended to diagnose, treat, cure or prevent any disease.